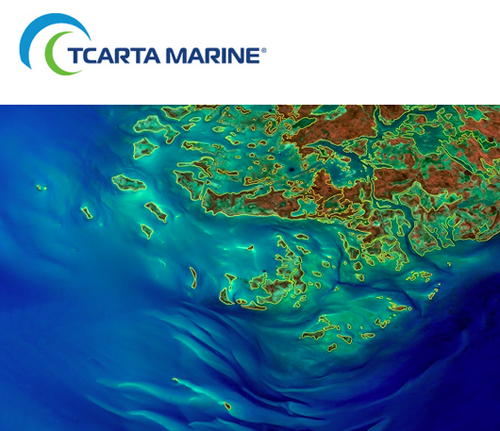 According to TCarta Marine, the company has made the world’s most dynamic environments easier to monitor and manage with the introduction of their new, multi-scale, Shoreline Products — offered in GIS-ready vector format, the Shoreline data sets are derived from satellite imagery and accurately delineate mean sea level for the land-water interface at coastal areas around the world. TCarta Marine, a global provider of marine geospatial products, is creating the Vector Shoreline Products at Global, National and Local scales for mapping applications as diverse as environmental protection, coastal infrastructure development and flood insurance rate calculations. Many of the Vector Shoreline Products are available off-the-shelf, while others are custom derived from archived or newly collected satellite imagery. Available off-the-shelf for the entire world, the Global Vector Shoreline products are 1:60,000-scale vectors derived from U.S. Landsat satellite imagery. The data sets include 2 million linear kilometers of coastlines, 400,000 islands, and thousands of rivers and streams. This scale provides broad-area resolution in a manageable file size ideal for monitoring global change over time. The National Vector Shoreline Products are 1:20,000-scale vectors created for coastal zone management and environmental monitoring of specific regions. Derived from 10-meter-resolution European Sentinel 2A/2B imagery, these products are available both on demand and off the shelf. Vectors for Africa, South Asia and the Bahamas have been created with additional regions added and updated continuously. A Classified National Vector Shoreline is also being derived from the multispectral Sentinel imagery for use in complex coastal ecosystem modeling applications. These 1:20,000-scale vectors contain classified polygons differentiating land cover types, such as Sand, Rock, Vegetation, and some man-made features, including Causeways and Jetties. For projects requiring a higher level of detail, such as insurance rate calculation, oil & gas infrastructure development and nautical charting, TCarta Marine is generating 1:2,000-scale Local Vector Shorelines from high-resolution DigitalGlobe WorldView satellite imagery. These are primarily on-demand custom products, and orders can be placed for periodic updates to perform detailed change monitoring over time. TCarta Marine delivers the Vector Shorelines via FTP or as streaming data service directly into a GIS or other mapping software. Each product contains metadata indicating collection date and acquisition sensor.